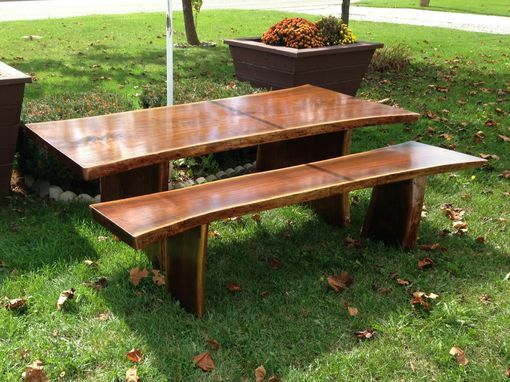 This project is made from 3 dark walnut slabs. The table and bench have a waterlox finish. The legs can be detached from the tops for easy assembly and disassembly. Tools required are simply a #3 Phillips screw driver. The legs are fastened to the tops with fully concealed stainless steel brackets and heavy duty threaded inserts and machine screws. The bench includes adjustable feet that are adjustable in two inch increments. This design can be made available in different species and sizes depending on availability. Feel free to contact me anytime about getting your very own custom made.